When Gauguin first arrived in Tahiti in 1891, the island was far from the unspoiled paradise that he had envisioned, as colonial rule and Christian missions had been undermining the native culture for nearly one hundred years. Writing to his wife Mette, he complained, “The land of Tahiti is becoming completely French and little by little, all the ancient ways of doing things will disappear. Our missionaries have already imported a lot of hypocrisy…while sweeping away a part of the poetry.”  He used painting as a way to create the exotic, primitive Tahiti that he had hoped to discover. Images of demons were not prevalent in Tahitian culture—Gauguin’s depiction of the spirit of Varua ino in human form was an invention of his own imagination. The woman’s pose evokes traditional representations of Eve after the fall. The painting was shown in Paris in 1893 and 1910 and made its American debut at the Armory Show, where New Yorkers were first introduced to Gauguin’s work. Lent by the dealer Ambroise Vollard, the painting was listed in the Armory Show catalogue with the title L’Esprit du mal (The Spirit of Evil), and was one of thirteen Gauguin works on display, ten of which depicted Polynesian subjects. Paul Gauguin to Mette-Sophie Gad, June 29, 1891, quoted in Colta Ives, “Gauguin’s Ports of Call,” in The Lure of the Exotic: Gauguin in New York Collections, exh. cat. (New York: Metropolitan Museum of Art, 2002), 77. 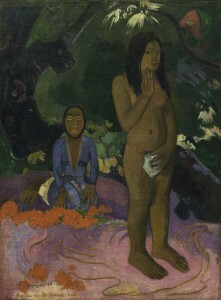 The narrative was inspired by Gauguin’s understanding of the Tahitian fear of demons, a theme he explored in a number of paintings, including his Manao tupapau (Spirit of the Dead Watching) (1892, Albright Knox Art Gallery, Buffalo, New York). See Christoph Becker, Gauguin and Tahiti (Ostfildern-Ruit: G. Hatje, 1998), 40. “Ultra Moderns in a Live Art Exhibition at 69th ’s Armory,” New York Evening Mail (February 17, 1913): 8. “May Bar Youngsters from Cubists’ Show,” Chicago Record-Herald, March 27, 1913, quoted in Susan Alyson Stein, “From the Beginning: Collecting and Exhibiting Gauguin in New York,” in The Lure of the Exotic: Gauguin in New York Collections, 157. Born in Paris in 1848, Paul Gauguin worked as a stockbroker before deciding to pursue a full-time art career in 1883. He initially exhibited Impressionist-style pictures, but by 1888 had turned his attention to depicting the exotic and the primitive, first in the French coastal town of Pont-Aven and later in the South Seas. Gauguin made his first trip to Tahiti in 1891, seeking to escape the West. When he retuned to France in 1893 the Paris-based dealer Paul Durand-Ruel organized an exhibition of his recent Tahitian paintings, but the show was a financial failure and further confirmed Gauguin’s disillusionment with western culture. In 1895 he returned to Tahiti, and in 1901 he settled in the Marquesas, where he died in 1903. Soon after Gauguin’s death a memorial exhibition of his work was mounted in Paris at the Salon d’Autome of 1903, followed by a larger retrospective of his work at the 1906 Salon d’Automne. These exhibitions helped to establish Gauguin’s reputation as a great modernist innovator, and his works were exhibited with increasing frequency in Europe in the years leading up to the Armory Show. The dealers Ambroise Vollard and E. Druet regularly displayed his work in their Paris galleries, and in 1910 Roger Fry included twenty-five of Gauguin’s paintings in his landmark exhibition Manet and the Post-Impressionists held at the Grafton Galleries in London. This show was widely covered by the New York press and generated interest in Gauguin. Some American collectors had already begun acquiring his works, including Gertrude and Leo Stein as early as 1904 and the Chicago heiress Emily Crane Chadbourne by 1910. But for the most part American audiences would have to wait for the opening of the Armory Show to see Gauguin’s work firsthand. See Gauguin: Maker of Myth, Belinda Thomson and Tamar Garb, eds., exh. cat. (Princeton: Princeton University Press, 2010). Gertrude and Leo Stein purchased two Gauguin paintings in 1904; Emily Crane Chadbourne, a member of the Stein circle, acquired at least seven Gauguin drawings by 1910. See Susan Alyson Stein, “From the Beginning: Collecting and Exhibiting Gauguin in New York,” in Colta Feller Ives and Susan Alyson Stein, The Lure of the Exotic: Gauguin in New York Collections (New York: Metropolitan Museum of Art, 2002), 151-152.